Projector Films - new ideas for film makers: What is "The green circle"? This circle (out of the three) looks at your story. 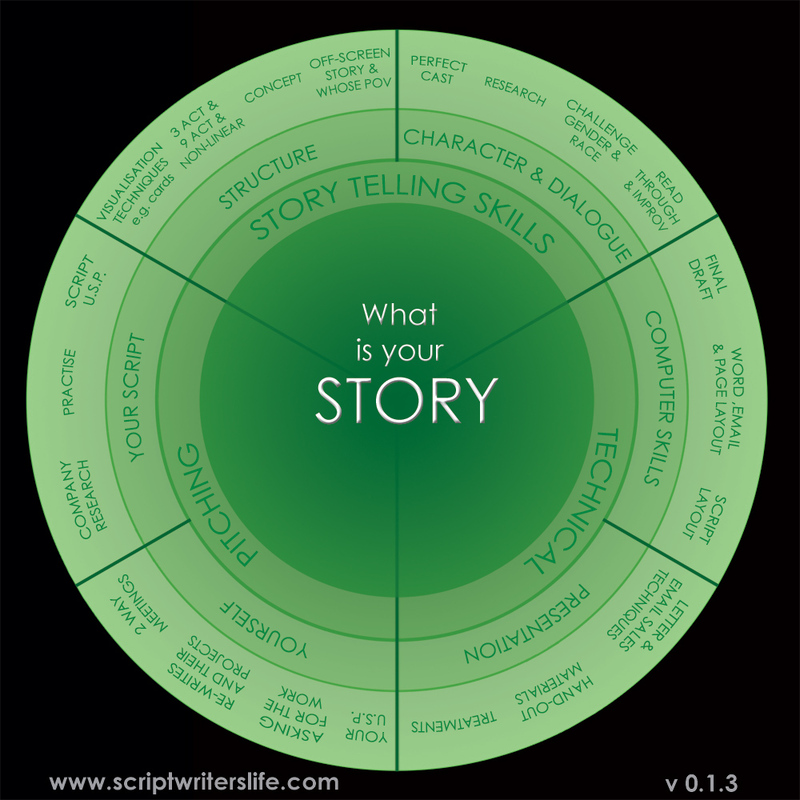 How good are you at the nuts and bolts of the scriptwriting craft? Can you do the work? Can you do it well? Story telling skills - Can you tell a good tale? Technical - Can you tell it in the right way? Pitching - Can you tell other people about it competently AND tell them about yourself? What is interesting about this is to compare this diagram to any training you may have had. Most courses concentrate only on the first section. They focus only on story telling skills. And, in a way, they are right to do that. It is important. And, as you can see, the Scriptwriting Life diagram reflects that - we say it is important as well. What the diagram challenges us to think about is the importance of our technical skills and our pitching skills also. I was never trained in these. But that's crazy. The more you think about it - the more crazy it seems. We must be good at our pitching skills if we consider ourselves writers and we must know about layouts, treatments and IT skills. So, yes, storytelling is crucial - but so are other things. And we still have two more circles to go. The blue and the red. That's when I realised how crap I was. I been concentrating all my effort in just one small slice of a much bigger complete picture. this diagram could be the best 'one/page' resource I've seen for screenwriters out there. Get your money back and spend it on making a film!